First. The next Saturday Coffee Shop Ride will be Saturday June 20. We'll depart at 9am from Scooters near the intersection of 57th and Western (5009 S Western Ave). Half a year ago we truncated our attempt at this loop due to heavy snowfall causing unpredictable riding. 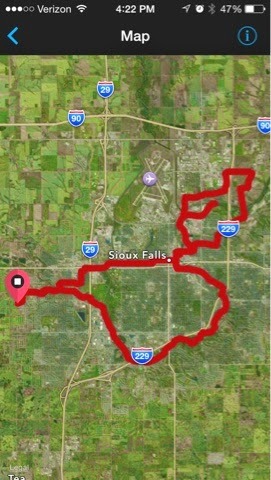 It will be nice to get a proper ride done on this southern loop. I think it's got some nice features. What about today? Today a whole bunch of us descended upon the Manna Bakery. Could it be that riders like a challenge? 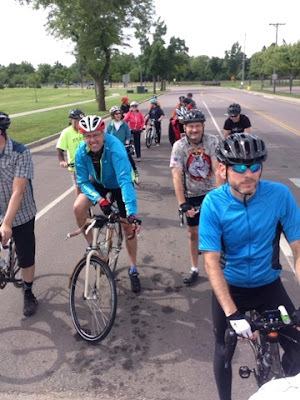 Did holding the Saturday Coffee Shop Ride on Sunday cause the attendance record to be broken by riders coming out to prove they can't be fooled by a misnomer? Time may tell. The Manna Bakery doesn't mess around. Whilst we hung around outside before and after our ride a steady stream of customers arrived and departed with fresh baked pastry goodness. Don't be disappointed that once inside you can barely remove your helmet without bumping into a powdered sugar covered something-or-other. They have maximized their pastry product capacity. Curiously while I shot this picture a driver stopped and waited. I joked that he might be waiting for me to step or fall off the curb so that he could run over me. As I completed my photographic artistry he called me over. 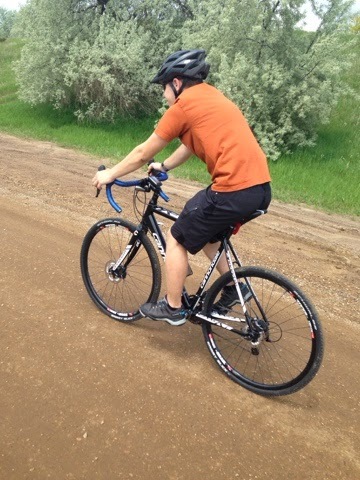 He inquired after my knowledge of Falls Area Singletrack, something I do happen to know a thing or three about. Sid thanked me for the trails at Leaders Park. As a kid he used to live near and mess around in the park. As an olderish man he's ever so pleased that he can still move around in the park because we've cut trails through the brush for him. To all the volunteers who built and continue to maintain Leaders Park, that one's for you! Here's our group descending what I think is Cleveland Ave.
Our group anxiously awaiting a green light at 10th and Fairfax. Anxiously because it became clear that 20 riders stopped for a red light was still not going to be enough for the traffic engineer to turn it green for us. Deep red-light-running contemplations were being weighed when the Harvest Church bus arrived for a left turn and immediately activated the trigger. Like Manna from heaven. 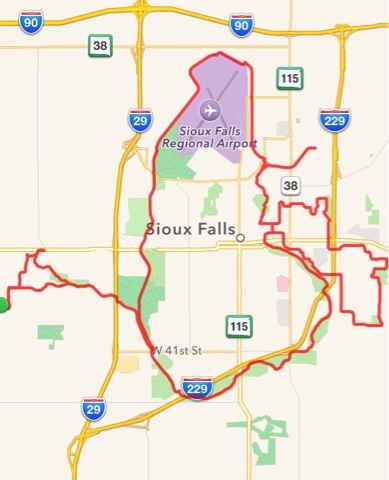 The Saturday Coffee Shop Ride is a 10 mile loop, which is pretty short for many riders. This morning The Boy 17 and I departed an hour early with neighbors Clint and Noah. We made our way around the southside of the bike trail. Rode the coffee shop ride. Rode the bike trail north to home. In the end, 40 miles. 137 for me for the week. On my way home from work today I chatted with Gregg, said hi to Kris, Tammy, Kris (again but much later) and chatted with Clint who was fresh from a visit to Madison, 'sconsin. I rolled up Main Ave behind a curb hugging woman. We arrived at 9th & Main where her right side lane position blocked my right turn. So I got in line. Not long after I heard a different woman speak from behind me - "Do you like those big tires? Do they make your bike harder to pedal?" Well you caught me, didn't you. But notice, FULLY THREE riders were stopped at the same red light at the same time. Also, women are the measure of successful bike infrastructure and the Main Avenue road diet is amazing. After pre-riding the loop for Sunday's Saturday Coffee Shop Ride I found more gravel than I'd like for this ride - so I radically altered the route. The final word: Sunday's Saturday Coffee Shop Ride which is on May 31 leaves the Manna Bakery at 9am and follows a route that goes a lotta something like this...unless I find something whilst pre-riding. 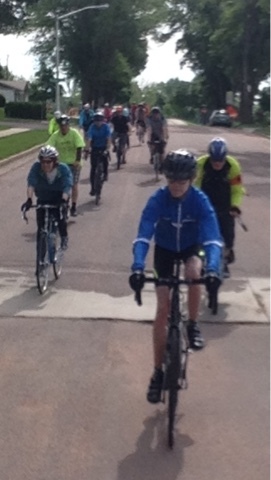 The next Saturday Coffee Shop Ride will be SUNDAY May 31. SUNDAY. I cannot emphasize enough that SUNDAY is the next Saturday Coffee Shop Ride. Pay attention. There will be a quiz at the end. 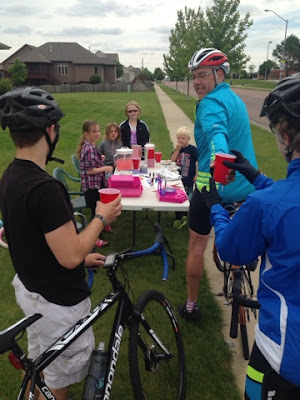 Sunday May 31 is the next Saturday Coffee Shop Ride. 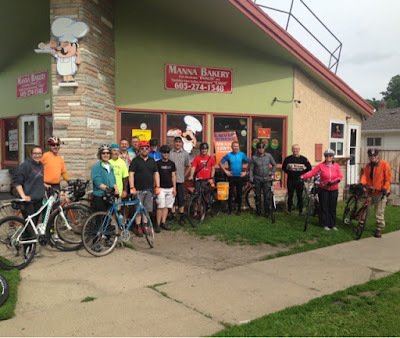 It will depart from the Manna Bakery - 812 E 6th St. We'll venture a bit into the northeast quad of the city then take a look at the new-ish trail spur that diverts near the diversion channel. The ride leaves at 9am. The loop is just shy of 12 miles and is as always weather adjustable. We'll enjoy manna from heaven (or maybe just from the bakery) after. There are general expectations of the Saturday Coffee Shop Rides. Faster riders may find the slowish speed of this ride mentally taxing. Pop quiz hot shot. 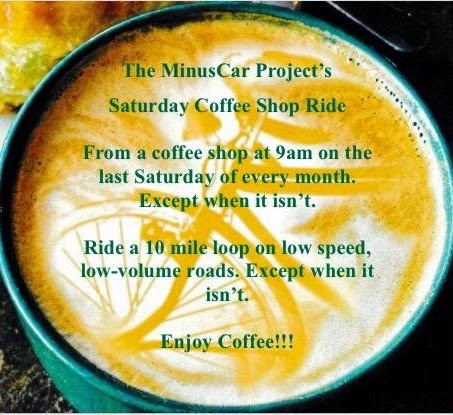 There's a Saturday Coffee Shop Ride schedule for Sunday May 31. What do you do? Soymilk & cinnamon sugar. Absulotely necessary before school tomorrow. 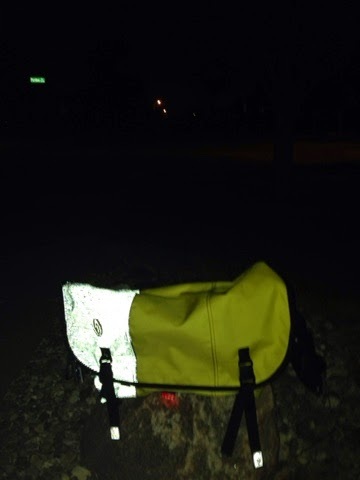 Night ride!